As spring is slowly becoming summer and we’re all spending more time outdoors, my guides wanted to fill us in on the basics of taking care of the habitat where you live. 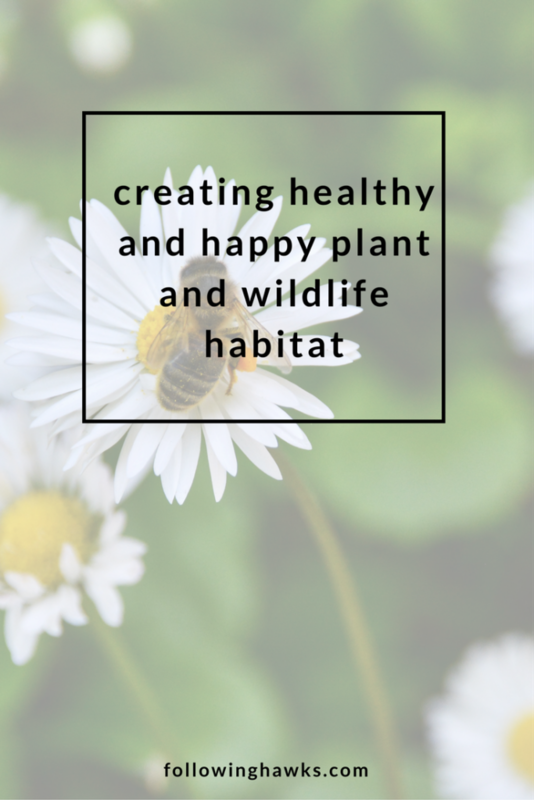 We covered starting a garden with the help of fairies a few weeks ago, but this time we’re talking the bigger picture – the ecosystem that we’re also a part of and creating happy plant and wildlife habitat wherever you live. What’s funny is that the first image I was shown was an apartment balcony that I had back in my early 20’s. Not exactly what you think of for ideal wildlife habitat. I was on the second story and had a standard little apartment deck off my bedroom and I hauled all kinds of things up there (I’m sure the neighbors thought I was nuts). I had a small cedar tree in a large pot that my cat loved to lay underneath, a decent sized fountain and a hummingbird feeder. One spring, I was feeling especially industrious and got the long rectangular plastic balcony planters and lined the balcony railing with them, filling them with annual flowers. I would enjoy spending my evenings after work on the balcony, sitting in my little wicker chair, watering the plants and listening to the fountain. Even though my not so glamorous view was of the parking lot. A few weeks after planting the flowers, when they were getting full and lush, I noticed that the cat was especially intent on watching something out the window. A mourning dove had moved into the flower box closest to the window and was building a nest under the flowers. I mean, of all of the places in the area, why my deck, under the watchful eyes of a cat, not to mention dealing with me attempting to water the plants just enough to keep her cover alive, while not flooding her nest?! But she didn’t seem to mind (much) at all and raised two sets of babies in that nest that summer. Once they were large enough to fledge, I stayed off the balcony and let them have their space, while getting a front row seat to the show! But on my little deck in the middle of rows and rows of apartment buildings I was creating happy plant and wildlife habitat. The basics include some kind of cover to provide protection for smaller animals and birds, an open sunny space, food and water. My guide also said that it’s our job to bring our healthy energy and when I asked what she meant by that she said – bring your love for the space, to the space. She wanted to emphasize that everything is part of the whole system, even us. Because everything is connected, you cannot touch one thing and expect to not touch it all – just like a spiderweb. I asked about how we should handle what we might consider a nuisance: wasps buzzing on your patio, rats stealing fruit from your trees, and she said that we should ask ourselves…are they bothering us, REALLY? And if so, what is it that’s attracting them that may need to be moved or removed so they’re not so close to you. In fact, she said, they have to learn to live with US! She emphasized that just because we might be the largest one in the ecosystem, that does not make us the most important. We are just a piece of the whole. So how can we participate in the ecosystem we live in? Take time to observe your surroundings. What is it that’s needed that you can provide? We have the benefit of arms and legs to get things done. A bird cannot drag branches into a pile to make a safe place to hide from predators, but we can, and they appreciate it. We should educate ourselves and learn about the other beings present. Even small adjustments made by humans can have huge consequences to the ecosystem. They can be positive, like making a small brush pile for birds, or negative like spraying chemical fertilizers because we don’t want to spend the time it really takes to eradicate invasive plants by shifting the health of the overall environment we live in. If we encounter an outbreak of invasive weeds or an insect infestation, we should ask ourselves what is missing or out of balance to create this situation and is there something we can do to help? Or is this simply nature taking its course and we should allow it. If humans left the earth tomorrow, the plants and animals and insects would quickly recolonize all that we have built and created for themselves. They don’t especially need us, so while creating a happy habitat for yourself, consider what it can bring to you and help Mother Nature along. Or, simply enjoy it and let it work the details out on its own, as it can do perfectly without us. Oh I just love this! I think my feeling to start growing some plants in milk bottles I must do!!! We have a rosemary bush outside and it is right by the wash line. I just ask the bees to not sting me and I won’t bother them. Working thus far and I LOVE THEM being there.